An artwork can take you by surprise. You might walk around a museum, look at the works one by one and then suddenly catch sight of a particular painting in the corner of the room. A stranger’s portrait can make you forget the time and place while a museum’s architecture and atmosphere can give you goosebumps. Some people’s experience of a painting or a sculpture is like an infatuation which you keep coming back to, while others travel a long way to visit a specific place. Faaborg Museum and the University of Southern Denmark have set out to examine these sorts of experiences through a collaborative research project running from 2015 until 2018. Two researchers are working on the three-year project. Theis Vallø Madsen is investigating ‘presence’ as a theoretical concept and will be publishing his findings in a series of articles. 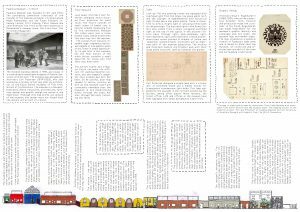 Tina Anette Madsen is researching her doctoral thesis on the museum-goers’ experience of presence and atmosphere taking Faaborg Museum as a case study. The aesthetics of ‘presence’ considered by French philosopher Jean-Luc Nancy, Professor Hans Ulrich Gumbrecht, Dr. Eelco Runia and others is the starting point for the project. In recent years this methodology has received considerable attention from researchers and practitioners across a range of disciplines such as architecture, literature, art and design. Paradoxically some people travel far and wide in search of presence and the architecture, history and location of Faaborg Museum make it an absolutely perfect place for research on ‘presence’. The building’s colourful mosaic floor interacts with the furniture design, its many corridors and its small nooks and crannies. You need to engage your mind as well as your body. In return, museumgoers have the opportunity of accessing the ‘here’ and ‘now’. The project researchers are using the Museum as a laboratory for presence theory and related theories on atmosphere, ‘affect’ and materiality. Their studies will include experiments with exhibition designs and museum education while also taking part in a wider discussion of the Museum’s role within society. In 2014 THE VELUX FOUNDATION allocated DKK 2.8 million to Faaborg Museum for the project as part of their major initiative for museums. The project is a collaboration between Faaborg Museum and the Institute for Cultural Studies at the University of Southern Denmark (SDU). Both institutions are also co-funding the project. IN THE NOW ROOM is a small temporary room with one artwork and one chair. The room’s paper walls are suspended from the ceiling with only the entrance and door, a chair and an easel with a painting touch the floor. The guests are encouraged to enter the room one at a time. In the room, visitors have a chance to meet an artwork one-on-one and without the presence and gaze of others. Other visitors are asked to wait in the waiting room on the other side of the small room. Behind the door, visitors are alone with an artwork as opposed to the rest of the museum where one is free to wander about, look and talk with others about the artworks on display. IN THE NOW ROOM is part of the “Art and Presence” research project at Faaborg Museum and University of Southern Denmark with funding from the Velux Foundation. The waiting room is equipped with a small presence library with some of novels and the theoretical texts that are used in the research project. The lamps are kindly on loan from Le Klint. Brandts 13 in Odense had a similar one-work exhibition in corporation with Faaborg Museum (now closed) . One of the project researcher has been experimenting with drawing and mapping as a research method. 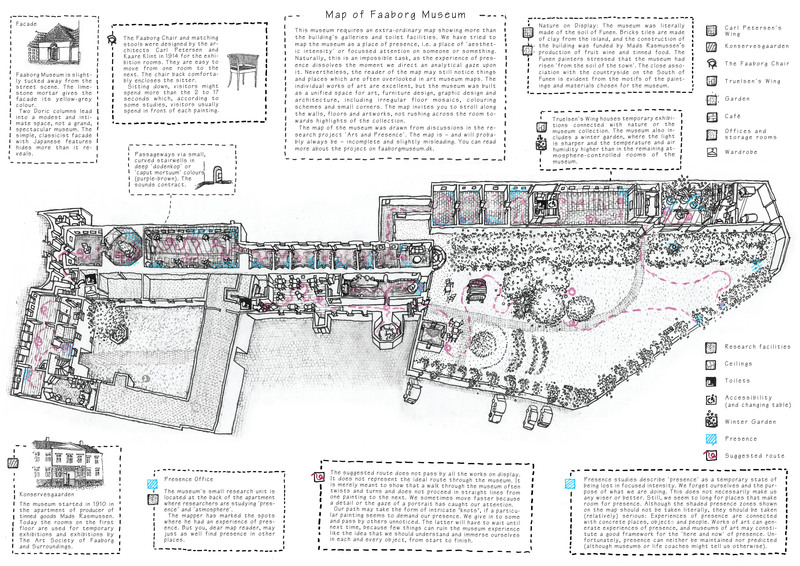 The idea was to draw a map of the museum that does not give guests an overview of the place. It should rather make museum-goers a bit shortsighted. It is an attempt to map some of the things that give the museum its unique atmosphere. It was an impossible task, of course, but the result might point to certain aspects of the museum that are often overlooked. Guests are encouraged to take a map, loose track, get lost, look closely and explore with curiosity – and hopefully experience the museum in a new way. The map is part of the research project “Art and Presence” at Faaborg Museum and the University of Southern Denmark, which is funded by the Velux Foundation. 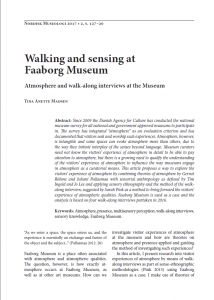 PhD student Tina Anette Madsen’s research articleWalking and Sensing at Faaborg Museum is now accessible online (click on the image to the right). The journal Danske Museer (Danish Museums) published an article about the research project (in Danish).